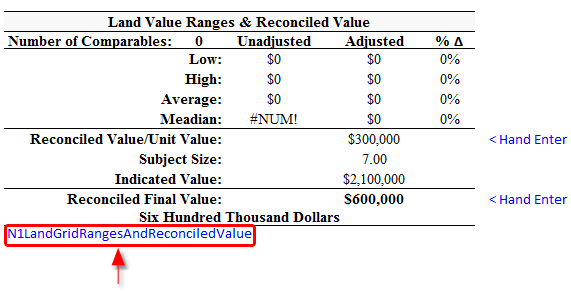 To get a field (a single cell) or table (range of cells) to Word, name the cell or range with "N1" as the first two characters. For example, N1MyData or N1MyTable. With Excel 2007, named ranges with charts/graphs need to have the word "Chart" in the range name. For example, "N1MyPopulationTrendChart". Otherwise, the chart or graph wont link properly in Word. To insert the field in Word, run the fields and tables dialog. The name will be included in the list, but without the "N1" prefix for easier reading. Name the cell (ranges cannot be saved to the database) with "N1DB" as the first characters. For example, N1DBCondition. 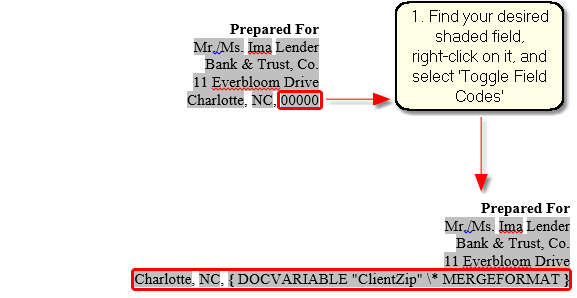 Note that the database must have a field with the same name, less the N1DB prefix (see help). In this example, there must be a "Condition" field in the database. Cells with N1DB names do not merge to Word. To link to Word, add a second name to the field. For example, N1Condition. If the database field name has a space in it, substitute an underscore. For example, N1DBYear_Built. See Database The Subject for saving the data to the comps database. 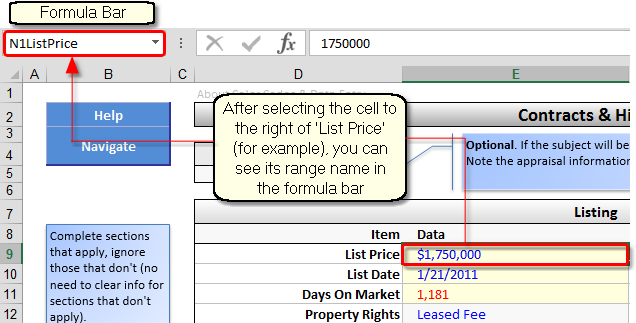 To find the name of a cell, select the cell, then view the Name box in the Formula bar. Most tables (aka ranges) have the name in the lower left corner in blue text. Each comp sheet has the name in the upper-left corner in light gray text. 1. The Word Fields and Tables dialog has a complete list in alphabetical order. 2. Place the cursor in the field, right-click and select "Toggle Field Codes" (or press Shift-F9). This will reveal the field name. This works for fields and tables. For example, entering N1SalesGrid in Excel's Go To dialog will select the sales grid.